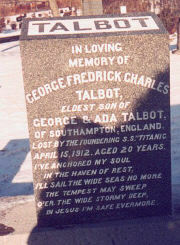 ( aged 2 ) The headstone of "the Unknown Child", is in serious need of more maintenance, it's virtually unreadable. I'd like to ask everyone to think about giving maybe a couple of dollars to the fund if possible and spread the word to other Titanic buffs you might know and might be interested. Before I give the address, I want to make one thing clear: I'm not getting a cent of this, and neither are any of the politicians. It's not going to paving our roads or better computers in school. 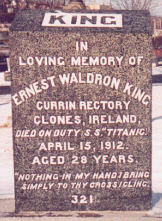 The museum isn't getting it, It's put away strictly for the upkeep of the 150 Titanic graves. long and faithful service. 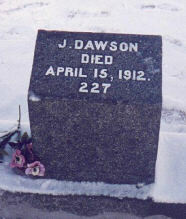 The infamous J Dawson grave. 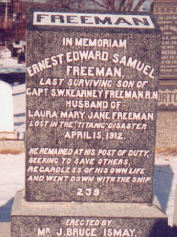 Footnote: Anyone visiting these graves this summer on vacation, some advice: look for "Titanic Tours" operated by the tour operators: the 3 hour city tour is only 10 minutes in Fairview Cemetery. If you've got more time to spare, do your own research and walk/cab it, it's cheaper by about 30 Cdn pp. Photos` © P . MacPhie 1999.